In the wintry months, when the air is still and conditions are right, the night fog rises from the lake and drifts through the moonlight to shroud the land. On those occasions, I like to get myself to the Fill at dawn, just as the sun is topping the foothills of the Cascades. If I’m lucky, the rising sun will warm the air enough to collect the fog into one bank of cloud in perfect alignment with the mountains. It is then that I will see gold. For I must reach East Point before the sun rises. At last I arrive at the overlook. Just in time. The fog bank has already risen from the water. It lies between me and the sun, just above the foothills, creating a narrow slit for the sun to shine through. The sky turns pink. The sun’s corona glows. And then the light bursts forth, carving a golden path over the water. The path widens until it becomes a road of molten gold, shimmering, beckoning. Ducks and grebes and geese paddle into the shining corridor to soak up the warmth. I cannot tell their species, for I am dazzled. Everything in my spirit tells me to join them, to step onto the road of light and follow it. Toward what? And how? I do not know, but still I yearn. The sun enters the fog, the light dims, the road narrows, the path disappears. It’s gone. 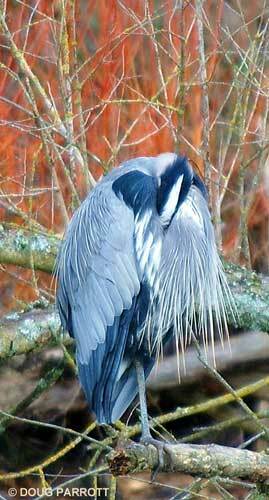 The Great Blue Heron who has been watching from the shore stirs his feathers briefly and goes back to sleep. He sees the sun-path often, and the mist, the moonlight and the dawn. He lives here. But I can only visit. This entry was posted in Uncategorized on November 30, 2010 by constancesidles.